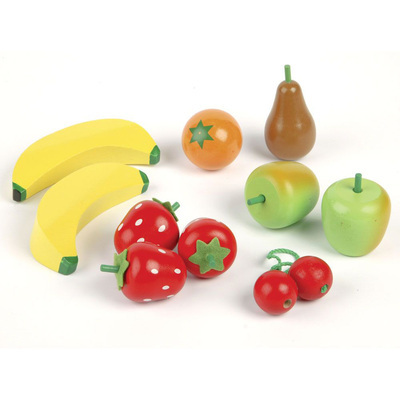 This set of Fruit Salad is the perfect addition to your play shop or kitchen area. It helps to introduce young children to the idea of healthy eating while introducing a range of different foods they may not already be familiar with. Each piece has been manufactured from a hardwearing wood that can be wiped clean after use. They are brightly and authentically coloured to help every child learn the importance of a balanced diet, where our food comes from and how we can prepare meals. Ask children to name each fruit or throw them together to make a hearty salad that their little imaginations are sure to adore. This fruit pack is perfect for nurseries, play schools and waiting rooms.